Clayton Murphy, a graduate of Tri-Village High School, will represent the United States in the 800 meter run at the Pan American Games. TORONTO – He’s won a state championship, finished third at the NCAA indoor and outdoor championships and finished fourth at the USA Track & Field’s Track and Field Championship. But the most exciting moment of Clayton Murphy’s track and field career still could be ahead of him and quickly approaching. Murphy, a 2013 graduate of Tri-Village High School, will compete for Team USA this summer beginning with the XVII Pan American Games in Toronto. “It’s right up there to be among the best experiences,” Murphy said. Even though it’s hard to quantify how special competing for the United States will be prior to racing, Murphy said it definitely will be right up there among his career highlights, possibly even atop his list of accomplishments and accolades. Murphy will run in the 800 meters at the Pan American Games for Team USA. He and Ryan Martin, a 2012 graduate of University of California-Santa Barbara, are the two athletes who were selected to represent the United States in the event. The Pan American Games are held once every four years with more than 6,000 athletes from 41 nations throughout North America and South America scheduled to compete in the 2015 games. The Pan American Games will run from July 10 through July 26 in Toronto with competitions in 37 sports. The American roster consists of 623 men and women, including 111 Olympians. The Tri-Village graduate, who now runs collegiately for the University of Akron, qualified for the Pan American Games with his fourth place finish in the 800 meter run at the USA Track & Field’s Track and Field Championship this past month at the University of Oregon’s Hayward Field. He just missed qualifying for the International Association of Athletics Federations’ World Championships in Beijing, China, but did well enough to earn a spot at the Pan American Games. Murphy will leave on July 18 for what will be the first trip outside the United States in his lifetime. He’ll run in the semifinals of the 800 meters on July 22 with the hopes of making the finals on July 23 before returning stateside on July 24. His goal is simply to qualify for the finals in the 800 meters. “Once I make finals, anything can happen,” Murphy said. After competing at the Pan American Games, Murphy again will represent the United States this summer at the North America Central America Caribbean Association Senior Championships in San José, Costa Rica, before preparing for his junior season of cross country at Akron. 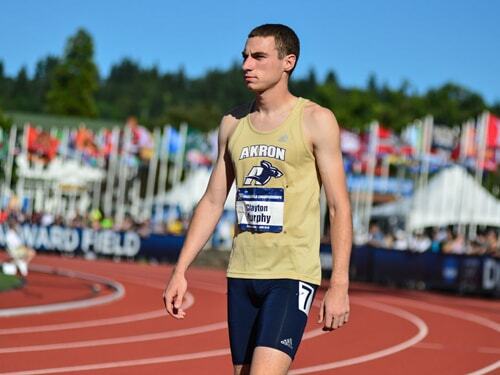 Murphy hopes to lead Akron to a Mid-American Conference championship in cross country and then get back to the NCAA championships in track and field. Next summer he will compete in the Olympic Trials with aspirations of representing the United States in the Olympics. “That’s always the goal in track, to make an Olympic team for your country,” he said. But before any of that happens, Murphy will get things started this month by wearing the red, white and blue at the Pan American Games. “It’s going to be really cool to put that jersey in a couple weeks,” he said.